Travel Planning with Google Maps: User Beware! Travel can be a crazy experience, even the most well laid out plans don’t go as expected, especially at times where Mother Nature plays havoc! We know our way around Australia with kids pretty well. Both ourselves and the kids are used to driving long distances, and we know the average travel time to our most common travel spots which helps us plan a little more easily. Until……. Mid 2011, I was booked in to attend a photography workshop, a wonderful international photographer was holding a workshop in QLD and I was so excited. To make the most of the trip interstate, we’d booked family accommodation, had tickets to The Australian Outback Spectacular, and were looking forward to some relaxation in the sunshine. We knew what time Matt finished work so we could leave, and what time we’d arrive. All sorted right? Wrong. There was a week long flood just days before my workshop started. The Pacific Highway was blocked right where we needed to drive through, and not in just one place, but several places, The Oxley Highway was our only chance to get there via the inland route, things weren’t looking good with that under water as well. It was very lucky for me that the Oxley Highway cleared the day before we were due to leave, so I dodged an expensive plane flight and we decided we wouldn’t let natural disaster defeat us, we’d just go anyway, even if the inland route was a little longer. Our Biggest Mistake with Planning an Alternate Travel Route. 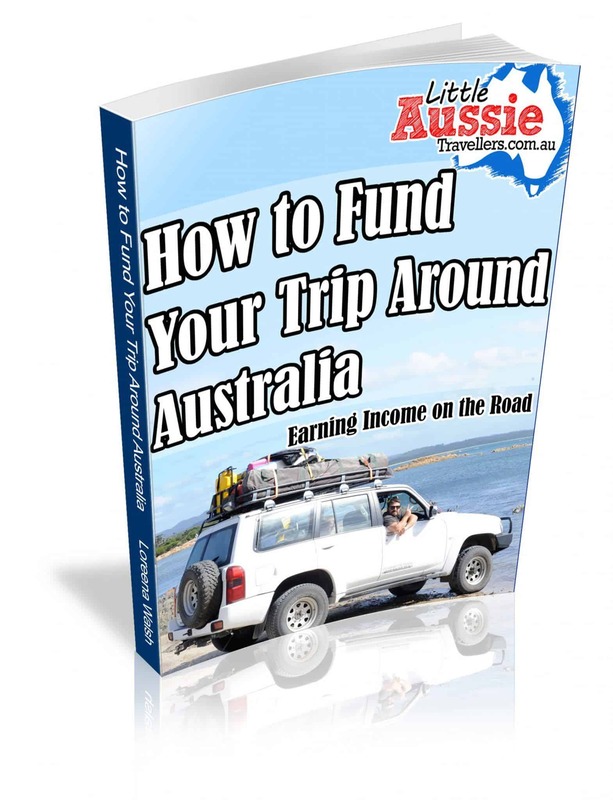 As I’ve said, we generally know how long it takes to drive from home, to most places around NSW and QLD, so we had a “rough” idea of what we were facing. We had some idea of which way we needed to travel and the towns we needed to go through, but trying to do our research, we decided to hit Google Maps to see if we were travelling efficiently or if there was a shorter way. BIG MISTAKE! We trusted what we found. Google maps appeared to show us a shorter way that appeared to save at least an hour, we printed out the details and didn’t think much more about it. Little did we know (and we didn’t realise until we were smack bang in the middle of nowhere) that Google had sent us up a very “unique” selection of roadways! We knew about the “correct way” to go. I’ve marked it out here in red, but we honestly thought there might be a better alternative, so perhaps naively consulted Google Maps to advise us of other possible options. 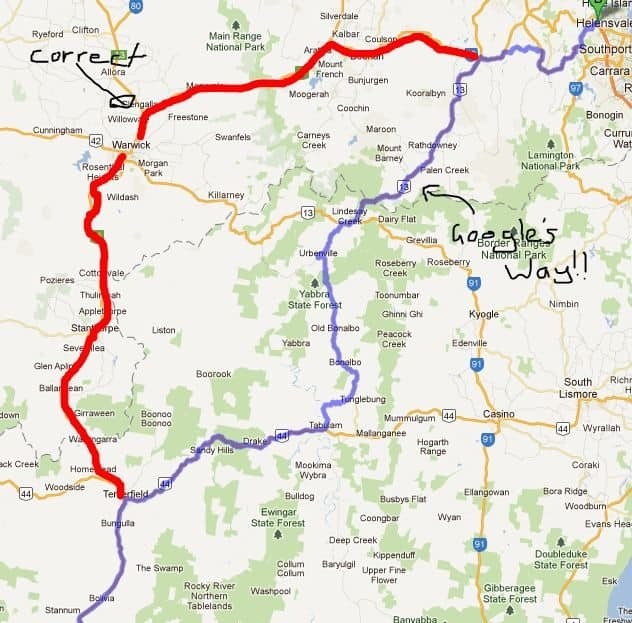 Thinking it was a major road that Google was leading us on, once we hit Tenterfield we kept following Google’s advised path…. You know you’re not about to travel up a major road, when you drive past your turn, having just mistaken it for a road into a farm, without there even being a signpost. That’s what happened. We were driving along, expecting to hit some sort of town, when we drove through a few houses, some paddocks and then my “little blue dot” on my iphone Google Map told me we’d gone past the turn. It was at that point I laughed, I mean, what else was I supposed to do! All I can say about that road is, that it’s probably a good thing we were in a 4wd! After an extra couple of hours of driving we were running late not only to check in, but also to our dinner booking for Australian Outback Spectacular! There were some wild, crazy roads on that journey, but it was somewhat compensated for by the amazing rainforest we drove through…..
We were severely running out of time, a quick toilet stop in a rest area gave the opportunity to change into “nicer” clothes for dinner, nothing like a family of 5 rummaging through luggage in the back of a car and getting changed in the dark in the bush somewhere! We had no other choice, we’d called our accommodation and organised an alternative access to our room, and drove straight to dinner. It truly must have been a miracle that we made it to dinner. We’d pre-paid around $300 so it wasn’t something we wanted to miss, although we did end up missing all of the pre-dinner entertainment! Now, of course, it may sound a bit silly that we planned our entire route just on what Google told us. Truth be told when we reached Tenterfield I had said to Matt “I’m not sure if we should trust this or if we should just go the longer way”. The longer way would have been much quicker as their would have been proper roads and not goat tracks, but we couldn’t have predicted what a wild ride Google would send us on! So just a notice to those who do as we did and plan out their travel route relying on Google, DON’T take it for granted that it will be anywhere close to correct! Scary! If we cannot trust Google anymore, who can we trust?? Great post, loved reading this on a quiet Saturday morning. Good side to things like this is that it might bring you to very unexpected places, creating a totally new travel experience!